How does Google differentiate “New” versus “Returning” visits? Before I get into the nitty gritty details, I want to make sure that you have a Google Analytics account and have the analytics code implemented on your website. If not, then check out Getting Started with Analytics. Here we go: When a user enters your website, a first-party cookie (aka: a unique visitor cookie which is used to collect Google Analytics data) is issued by the website being visited. This first-party cookie is set to expire after two years, and is stored on the user’s browser. In other words, if a user has been to your site in the past two years, the visit will be counted as a returning visit. For users who have never visited your website or used it prior to the two years of the cookie being issued, the visit will be considered a new visit. Sidenote: it is possible that a user who has previously visited the site cleared their cookies. In this instance, a return to your site would be viewed as “new”. Unfortunately there is no way around this, and for the purposes of this post, we will take these users out of consideration. 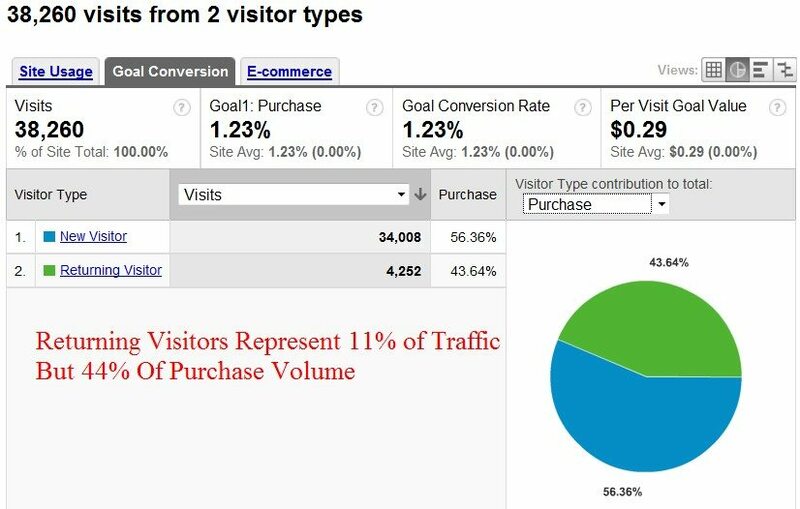 What Are the Benefits of Returning Visitors? Some website owners may think to themselves, “Why worry about returning visitors? They have already been to my website and they know that I exist. Shouldn’t my primary goal be attracting new visitors?” If you agree to the statement above, I hope my knowledge and experience will change the way you way think about this subject. 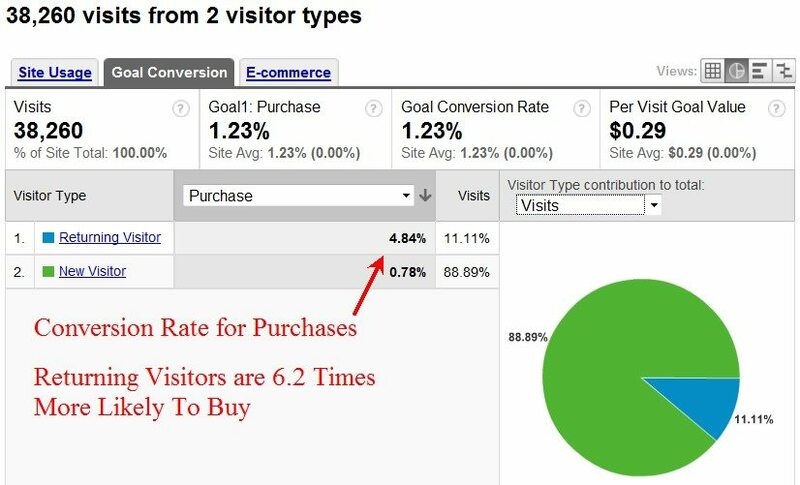 First, let’s remember that over half of the visitors that arrive to your website for the first time are not ready to make a purchase. They are somewhere in the Customer Buying Process: researching, looking for options, or even investigating alternatives. Recognition of a need – I would consider this the most important step in the Customer Buying Process as we know a purchase can’t take place without the customer recognizing the need for a potential purchase. Information/Research – Now that the need is recognized, the next step a customer may take is the Information/Research stage. This is when they investigate the best solution(s) to their problem. * Your potential customer will more than likely check out information you supply on your website, word of mouth, videos, news articles, etc. Analysis/Comparison/Options – As I’m sure you expected, consumers will now evaluate different options such as products and brands. * This is why the content you supply on your website is so important in the buying process. You need to be able to deliver information, answers, and benefits that the customers are seeking. Purchase Decision – Finally, we made it! After a lot of information gathering and research, the customer is ready to commit to a purchase. * Important: clear Call To Actions (CTA’s) are imperative. Don’t let your customers guess their next steps! It is important to remember that it can take several points of contact to make a sale.Now,after having a better understanding of the Customer Buying Process and considering the amount of time it may take to make a purchase decision, it sure is nice to have that returning visitor. Isn’t it? 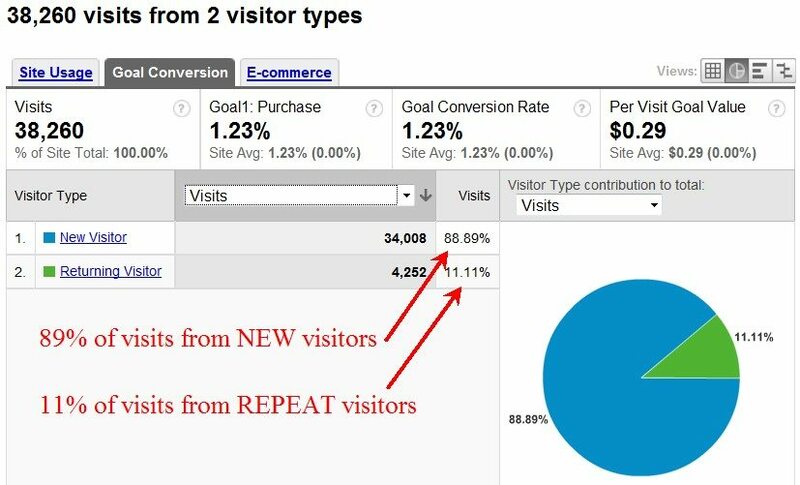 What Are the Benefits of New Visitors? Why do you want new visitors? This should be relatively obvious, but let’s elaborate just in case. They become aware that you and your products exist. You can answer the questions and needs that they have when they are in the research stages. They return when they are ready to make a purchase and convert. Search Engine Optimization (SEO) Campaign – SEO is the use of techniques, tactics, and well thought out strategies to increase organic (free) visits to a website by obtaining high keyword placement in SERPs (Search engine results pages) resulting in high visibility. Pay Per Click (PPC) Campaign – Online advertising using ads which generate leads to your website that is paid only if someone clicks on your ad. Here’s a great article on How to Beat Your Competition at PPC. Submitting you website to major search engines like Google and Yahoo Directory – Friendly Tip – Google is free and Yahoo has a fee. Word of mouth – I don’t think I have to explain. Getting links on high traffic reputable websites – Take a look at your competition that rank well in the SERP for keywords that you are targeting. See who they are getting links from, focusing on high authority websites, and try to obtain a link from them as well. Content creation – Creating blogs, videos, articles, etc. Before you move forward and begin your showdown with any of these strategies, I recommend you do a bit of research on your own to get a good understanding of the depth of these tactics. Otherwise, feel free to contact a marketing firm who have experts waiting to help you accomplish your online goals.